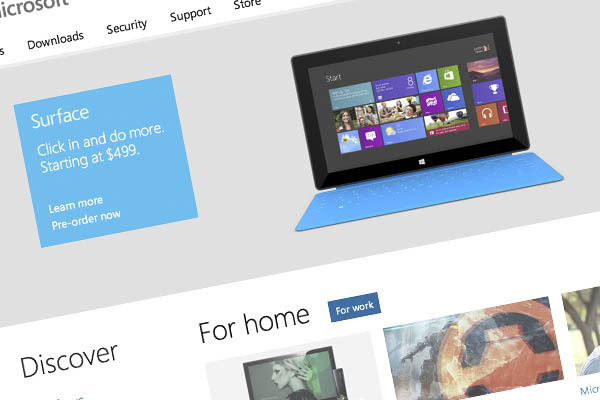 Microsoft has completely renovated its website with the idea that I have been repeating for five years. Mini-sites, mini-sites and mini-sites that allow unlimited growth and maintain aspects differentiated differentiated differentiated products and people. Besides, this is not intended for mobile devices, but to be touched, to touch devices. Congratulations to Microsoft and in five years repetire my bosses and colleagues the “I told you so.” I’m used to not heed me and that time I reason. As always, working 5 years behind what currently exists. And remember the next step. Social networking and browsing through these on your preferences to generate the web dynamically and adjust it to your needs. This is what you will see in about 3 years maximum, since there are already many projects they are working on algorithms (and not Google, Facebook or similar and have made​​).